Navy/Char/Berry 3 Pack Long Sleeve Tops is rated 4.3 out of 5 by 9. 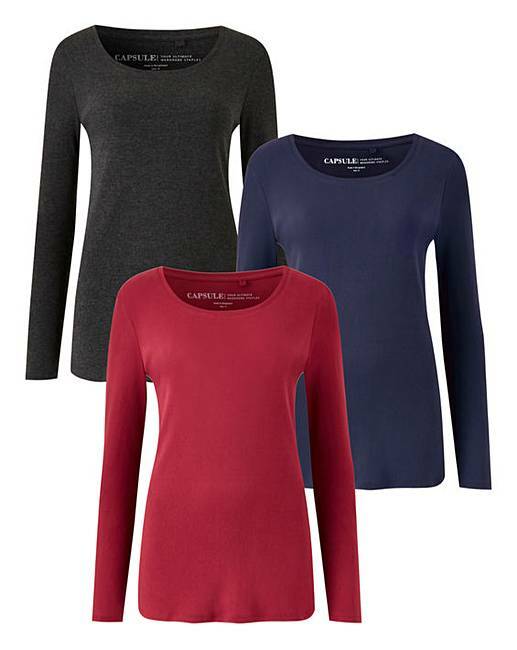 A wardrobe winner, these value cotton long-sleeved top will be a staple piece in your basics! These tops have been designed in super-soft cotton for extra comfort for everyday wear. This three pack comes in three versatile styles that can be easily styled for classic casual looks. Rated 3 out of 5 by Juju from Returned. Sent back as there was a flaw on the front of one of them. Rated 5 out of 5 by jacq from Nice Quality These T shirts are very nice quality for the price. To be honest I did not think they would be so good, they are very good. The cotton is soft but not thin. I have paid same price for one in the past and wss much thinner. These I can wear for best dressed up. So happy with my purchase. True to size and the colours are gorgeous. I highly recommend. Rated 5 out of 5 by tenderfoot from Comfortable Love these plain tops, wear most days, good Length and lovely lower neck. Rated 4 out of 5 by Michelle83 from Good quality Good tops true to size and a good lengh.good value for money. Rated 5 out of 5 by Nanaclock3 from Love these I really like these tops, just great to wear indoors with casual trousers.